This image of Comet Hergenrother, taken by the Gemini telescope on Nov. 2, 2012, shows several distinct pieces near the comet's core. A comet is falling apart on its trek through the inner solar system, and astronomers have a ringside seat for all the dramatic action. Amateur and professional astronomers have been following Comet Hergenrother for several weeks, noting some impressive outbursts of comet dust as it passed through our neck of the cosmic woods. Now it appears that the icy wanderer's days may be numbered. "Comet Hergenrother is splitting apart," Rachel Stevenson, a post-doctoral fellow at NASA's Jet Propulsion Laboratory in Pasadena, Calif., said in a statement. "Using the Gemini North Telescope on top of Mauna Kea, Hawaii, we have resolved that the nucleus of the comet has separated into at least four distinct pieces, resulting in a large increase in dust material in its coma." With more material to reflect sunlight, Hergenrother's coma — the diffuse envelope around its core — has also brightened a great deal, researchers said. "The comet fragments are considerably fainter than the nucleus," said Caltech's James Bauer, deputy principal investigator for NASA's asteroid-hunting NEOWISE mission, which used observations from the agency's Wide-field Infrared Survey Explorer spacecraft, or WISE. "This is suggestive of chunks of material being ejected from the surface." 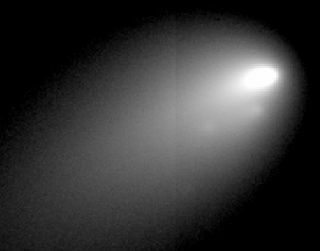 One of the newly created comet fragments has also developed its own tail, which runs roughly parallel to Hergenrother's main tail, researchers said. The comet's breakup was first spotted on Oct. 26, by a team of astronomers from Italy's Remanzacco Observatory who were using the Faulkes Telescope North in Hawaii. Since then, many other groups have trained their instruments on Hergenrother to watch the process unfold. The comet was discovered in November 1998 by Carl Hergenrother. It completes one lap around the sun every 6.9 years or so. Comet Hergenrother's orbit is well understood; neither the iceball nor its newly formed pieces pose a threat to Earth, researchers say. Hergenrother is fairly faint, requiring a large telescope to be viewed in any detail. The comet can currently be seen between the constellations of Andromeda and Lacerta, scientists say.